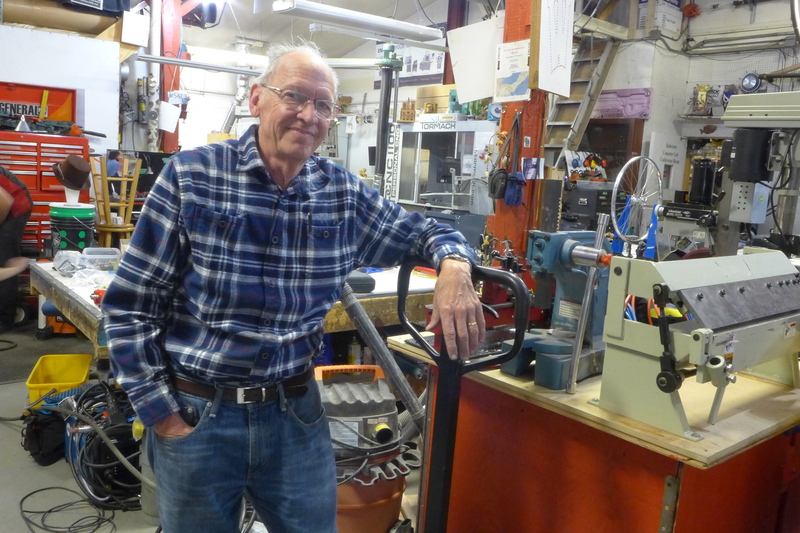 Former UW chancellor John Wiley at Sector 67, a makerspace on Madison’s East Side. The syndrome was difficult to diagnose, but Grist had a trick up his sleeve, one that he’d helped to invent decades before. Called 3D TRICKS, it is a technique that tracks blood flow in a magnetic resonance machine. Like good number of medical imaging inventions from UW-Madison, TRICKS has been licensed to GE Healthcare. 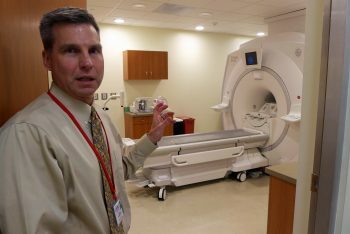 This giant in the world of medical imaging is an $18-billion division of GE that designs and makes some of the world’s most advanced scanners at its headquarters in Waukesha. Since the 1980s, GE has supported research into imaging technologies at UW-Madison. 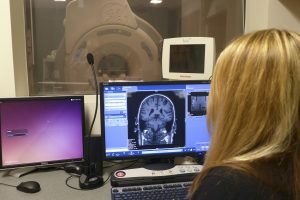 The latest agreement, a 10-year, $34-million contract, began in 2012 to fund radiology and medical physics researchers, who work on campus with the company’s newest CT (computed tomography), PET (positron emission tomography) and MR (magnetic resonance) scanners. says Jörg Debatin, vice-president, chief medical officer, and chief technology officer at GE Healthcare. An engineer at work in GE’s Waukesha headquarters. The company maintains dozens of instruments in test bays that resemble the normal clinical installation. In addition, GE hires a lot of Badger graduates. UW-Madison has historically been one of the top ten global universities in total number of alumni working at GE, according to company officials. 3D TRICKS is one of a long stream of inventions – for X-ray, MR, and CT and PET scanners, that have emerged from the world’s largest department of medical physics, and its parent, the department of radiology. A multi-decade relationship between UW-Madison and Wisconsin businesses like GE has created a stream of medical imaging inventions that look inside the human body with increasing accuracy to diagnose tumors, heart disease, osteoporosis and countless other conditions. For patient Wiley, the 3D TRICKS results were clear, Grist says. 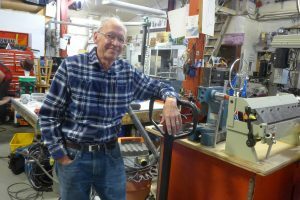 “We saw that the flow in the artery was backward.” After a stent was inserted to expand the subclavian artery, the fainting disappeared, and Wiley, who maintains his passion for welding, left the problem in the rear-view. It’s fitting that Wiley benefited from the partnership. As chancellor (2001 to 2008), Wiley ardently espoused the University’s role in advanced technology, and indeed, was co-inventor of a technology used in essentially all high-speed computer chips. This spring, Wiley learned with satisfaction that the diagnostic trick that Grist had used to catch the felonious artery was invented at the School of Medicine and Public Health about 25 years ago. The inventors included Charles Mistretta of medical physics, and two professor of radiology: Frank Korosec and Thomas Grist. 3D TRICKS joins a long procession of health-giving, profitable inventions from Radiology and Medical Physics, and it elaborated on a major UW-Madison imaging advance called digital subtraction angiography. Invented in the late-1970s by Mistretta and his students, DSA makes a lucid picture of blood vessels and any abnormalities by subtracting a normal X-ray from one taken with an opaque tracer in the bloodstream. DSA’s real-time images supported a wide range of procedures to correct blood vessel problems. More broadly, Mistretta says, “It was probably the major stimulus for the development of interventional radiology,” the medical specialty that uses various types of images to guide internal surgery, speeding recovery for treatment of stroke, cancer and kidney disease, among many others. “Clearly you could not do this without real-time capability to see where you were going inside the body,” says Mistretta. 3D TRICKS, like many other UW-Madison inventions, was licensed by the Wisconsin Alumni Research Foundation. “GE took it and disseminated it throughout the world,” Grist says. Sara John, an MRI research technologist at the UW School of Medicine and Public Health, at work with an MR scanner in the Wisconsin Institute of Medical Research on campus. A surprising portion of the radiology-medical physics story at UW-Madison returns to GE. For example, medical physics professor Richard Mazess invented scanners to detect osteoporosis in the 1970s. In 2000, he sold his spinoff, called Lunar Radiation, Inc. to GE Healthcare. The bone-density scanners are still branded Lunar and still made in Madison. GE Healthcare has more than 46,000 employees worldwide, including 5,900 in Wisconsin. 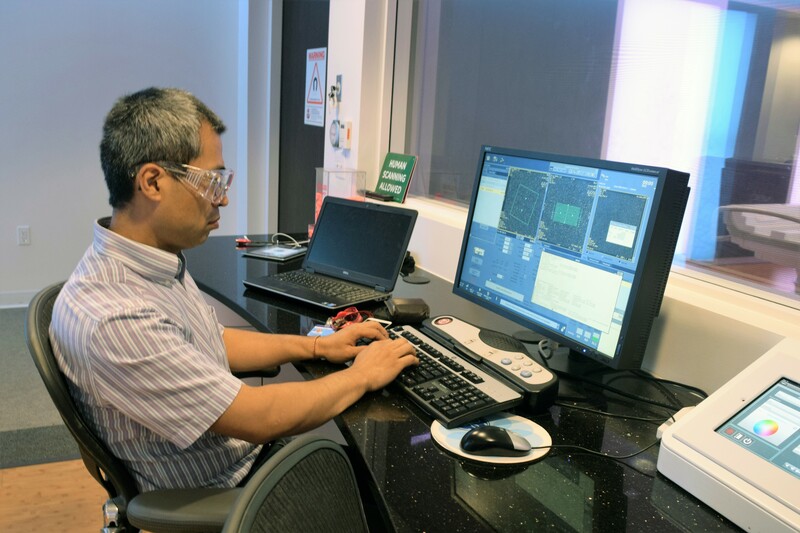 In Waukesha, GE makes a wide range of scanners that detect x-rays, magnetic resonance and tracer chemicals using PET. Grist spent part of the next year with GE’s fast-growing MR business, which, he says, “started a professional career in development of MR,” which included co-inventing TRICKS. Magnetic resonance and breast cancer: Studying changes over time may open a new way to diagnose breast tumors, says Korosec, who, as chief of imaging sciences at radiology, is helping develop that approach. A succession of images taken after the injection of a compound visible to MR shows how quickly the agent enters and leaves breast tissue. A quick wash-out signals a malignant tumor. Video digital subtraction angiography: Mistretta is working on a movie version of DSA that can analyze arterial venous malformations, fast-changing connections between arteries and veins that lack the usual capillaries. “You need to know about the feeder and exit vessels to plan an intervention, but a still image does not show the changes over time,” Mistretta says. Thin-slice, low-dose computed tomography (CT): Guang-Hong Chen, a professor of medical physics, has developed a technique to show more detail using less radiation. “GE has licensed our dose-reduction method and is disseminating it to 400-plus sites around the world,” Grist says. New tracers: PET (positron emission tomography) can identify vanishingly tiny amounts of tracers that are designed to latch onto molecules associated with abnormalities like cancer. Specialists like Jon Engle at the PET Drug Production Laboratory in Medical Physics are investigating new tracers. MR “calipers”: Scott Reeder, a professor of radiology, has developed software to detect fatty liver disease, a major cause of liver transplant. The condition is currently diagnosed by biopsy, but MR views the entire liver, leading to greater accuracy without tissue damage. Under license from WARF, GE is distributing the software worldwide. Frank Korosec, a professor of radiology, with a combination MR-PET scanner that is used for patient diagnosis in the morning and research in the afternoon. UW-Madison experts are also studying new combination scanners. For example, the PET/MR scanner, which looks at soft tissue (MR) and cells marked with tracers (PET). With the combination, “You can get information about a tumor (or other disease) that you would not be able to get with MRI or PET scanners alone,” says Korosec. The new devices are keeping UW-Madison researcher at the forefront of medical imaging. Researchers invent hardware and software, and demonstrate whether and how these technological advances bring real benefits to patients. “Sites with this cutting-edge equipment have to blaze the trail, to show why this equipment is important,” says Alan McMillan, an associate scientist in radiology. Some of the latest, greatest medical imaging devices in the world actually “live” in University Hospital; serving today’s patients in the morning while helping researchers invent and evaluate new ways to benefit tomorrow’s patients in the afternoon.